This past Sunday, the UCSD swimming and diving team celebrated its 13 seniors for Senior Day in the team’s last meet of the year against the University of Incarnate Word and San Jose State at the Canyonview Aquatic Center. The UCSD women (5–4) coasted by its former NCAA Division II rivals, University of the Incarnate Word (0–3) from San Antonio, who have recently transitioned into Division I. The Tritons took a definitive team win with a score of 205–54. Despite the large margin of victory, UCSD was defeated by the back-to-back Western Athletic Conference champion, San Jose State. The Spartans (4–2) took the win with a score of 140.5–115.5. The Spartans went on to defeat Incarnate Word 180–70. 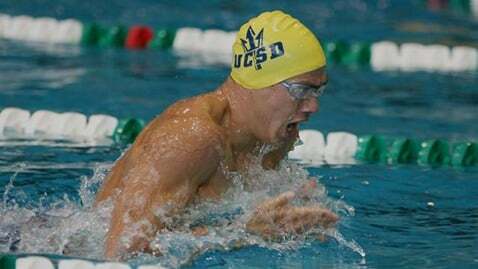 The UCSD men (1–4) faced off against Incarnate Word (1–2) and narrowly lost 134–128. The Tritons trailed early and, in the end, were unable to cut the deficit. Incarnate Word secured its victory by winning 1–2 in the 200-meter individual medley. 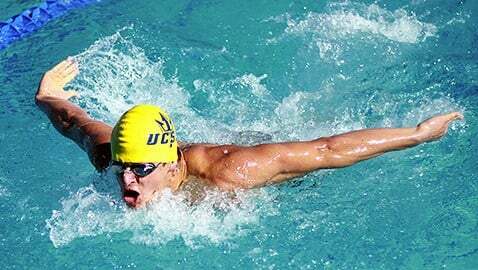 UCSD senior captain Nicholas Korth — a 2011 NCAA National Champion in the 200-meter breaststroke — added another amazing performance to his memorable career as he won first place in his breaststroke event. For the 100-meter, Korth finished with a time of 55.90 seconds, which was only .79 seconds away from the pool record. He also won first in the 200-meter, while Triton freshman Zach Yong took second place. Third place went to sophomore AJ Zavala. Senior captains Alex Merrill and Anji Shakya won their respective events. The 13 other seniors who were recognized were swimmers John Chang, Reid McCallum, Ahiram Rodriguez, Sandy Hon, Katie McBride, captain Lindsay Oosterhouse and Erika Rodman. Graduating divers included Natalie Mouzooni, Megan Zeeb and Luke Calkins, who has qualified for the NCAA National Champions four times in his four years at UCSD. Sophomore Naomi Thomas placed first in the 200-meter butterfly, while junior Jack Galvan also impressed in the 100-meter freestyle with a time of 47.69 seconds. After their final appearance this season at their home pool, the Tritons will head to Cal State Bakersfield. The men will swim against Bakersfield, while the women will also face Alaska and Loyola Marymount University.